Haven’t run a collector car auction post in a while, so here’s one with a Hollywood connection. 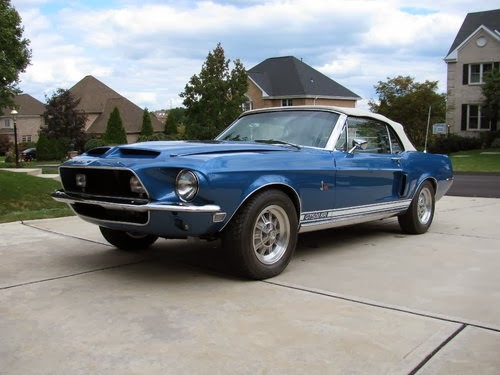 At Russo and Steele’s upcoming Scottsdale auction (January 15 to 19), they’re offering a 1968 Shelby GT500 KR convertible. It's one of only 318 built, and Marvin was the original owner, driving it until 1972. It’s had a few owners since, of course, starting with Mr. Marvin’s gardener, who received it as a gift. Nice boss! It had a concours-level restoration by Drew Alcazar in the ‘80s, and still has less than 47,000 miles on it. It comes with its Shelby Automotive Pre-Deliver Inspection form, and four original Shelby American 10-spoke wheels. Sweet. Hammacher Schlemmer offers some cool stuff. The latest to catch my eye was this Driving Activity Reporter. It does exactly what it sounds like it would. 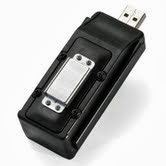 You attach it to a car inside or outside (it has a magnet) and it keeps track of where and how fast the car goes, using a GPS receiver. The data, in the form of animated maps, can then be viewed on your computer by plugging it into the USB port. Its memory will store up to 100 hours of driving activity, entering sleep mode when the vehicle isn’t moving. It does require two AAA lithium batteries to power it. While I’m not recommending you attach it to anyone else’s car—apart from the privacy issues, it would obviously be illegal—it would be a great way to record information about your route while on vacation. Since the data can be viewed with Google Earth, you could even add location photos. Might also be useful for tracking mileage for expense purposes on business trips. Or making sure no one’s used your car without your permission. Picked up a 2014 dream car calendar at the checkout of my local Walmart the other day. It’s apparently the 15th anniversary edition and looks like it would make a great stocking stuffer for anyone who likes cars. The calendar runs from December 2013 through to December 2014 and has a nice assortment of photos of exotics and classics, including a 2013 McLaren MP4-12C Spider and a 1964 Ferrari 250 GT Lusso. The cost is only 97 cents and 20 cents of that goes to the Children’s Miracle Network. There’s also a contest where you can enter a photo of your own dream car for consideration for the 2015 calendar and a prize of ArmorAll products. Not a bad deal—a great looking calendar and a charitable donation. I’m wishing I’d picked up more than one. Courtesy of our favourite handyman, Red Green. Got this sneaky suspicion it would void my lease, however.